John, the groom at Birtwick, has a recipe for dealing with horses that consists of “patience and gentleness, firmness and petting, one pound of each to be mixed up with half a pint of common sense”. What name does he have for this? After a wonderful early life as a young colt on Farmer Gray’s meadows, the stallion Black Beauty is sold to Squire Gordon of Birtwick Hall and joins the gentleman’s stables. While his existence is no longer as carefree as before and he has to be trained by humans, he enjoys the company of the other horses there, such as the fiery Ginger and the kind Merrylegs. Unfortunately one day he is sold on to new owners, and a new chapter opens in his life, full of uncertainty, hardship and cruelty. 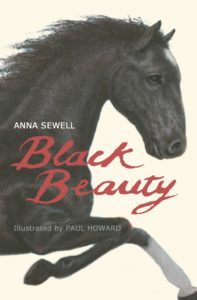 Will Black Beauty ever make it back home, or reconnect with the people and horses that cared about him?